Firewood is a valuable source of energy, whether it is collected or bought on the market. It involves financial or time resources of the household to obtain it. 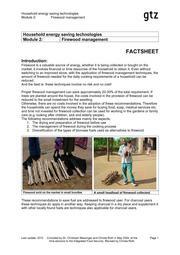 Even users of traditional cookstoves can save firewood by applying the following firewood management techniques. Clever firewood management can save approximately 20 - 30% of the total cooking fuel requirement. Freshly collected firewood contains up to 50% water. This water not only has no heating value, it is also consuming 25 - 35% of the energy of the wood to remove the moisture within the cooking process. Hence, wet wood has a low power output and a low temperature. Smoke is the visible indication of this wasteful practice. These unnecessary heat losses can be avoided if firewood is dried in the sun and stored at a dry place for at least 3 weeks (in the dry season) or more (in the rainy season). The splitting of branches and logs promotes a better drying of the wood in the sun. Firewood does not burn as such. It is the gasses generated in the process of its decomposition. For it to decompose, the wood has to be heated. Thick pieces of wood require a lot of heat to reach these temperatures. Hence, it takes a lot of time until the wood burns efficiently. Smoke is an indication that the decomposition of the firewood has not yet progressed sufficiently. Splitting the firewood does not only allow for a faster drying process. It also promotes a faster decomposition of the wood into woodgas. Hence less heat is wasted for the decomposition process and the fire is more efficient. Fresh wood is much colder than the wood in the reactor. If a lot of fresh wood is added to the combustion chamber, it cools down the temperature of the reactor until it is heated up to the same level. Additional wood will be placed on top of the wood which is already in the reactor. Hence it might cover some part of the surface of the already heated wood, reducing the space for the reaction between the air and the wood. Wood and air compete for the same space in the reactor. If too much wood is added, there will be at one point not enough space left to supply the air required for the combustion process. In an improved firewood cook stove, it is sufficient to start the fire with three sticks of (small) wood only. Once the fire is going, the heat can be regulated by the number of sticks. Do not go beyond 3 sticks at a time. In most cooking processes we can distinguish high-power phases (e.g. to bring a cold pot to boiling point) and low-power phases (e.g. for keeping a hot pot at the boiling point = simmering). Inexperienced cooks tend to use a lot of wood in the stove all the time, regulating the heat transfer through modification of the distance between the pot and the stove. This is a very wasteful practice. When the preparation is reaching a simmering phase, remove surplus firewood from the combustion chamber and leave only 1-2 sticks in the fire. It is a common observation that wood is still burning in a stove after the cooking has been completed. This wood should be extinguished once the fire is no longer needed. This applies as well for any burning wood which is removed from the fire e.g. at the start of the simmering phase. Extinguish the removed sticks of firewood in a sand-box. You can reuse these sticks in the next food preparation. These are fuel-specific recommendations for firewood, but they apply as well for other processed types of solid biomass. This fact sheet is a compilation of energy-saving practices and was developed by the Integrated Food Security Project in Malawi. Every practice is explained in detail and addition is provided regarding the reasons of fuelwood savings and additional benefits. This page was last modified on 4 September 2018, at 14:07.